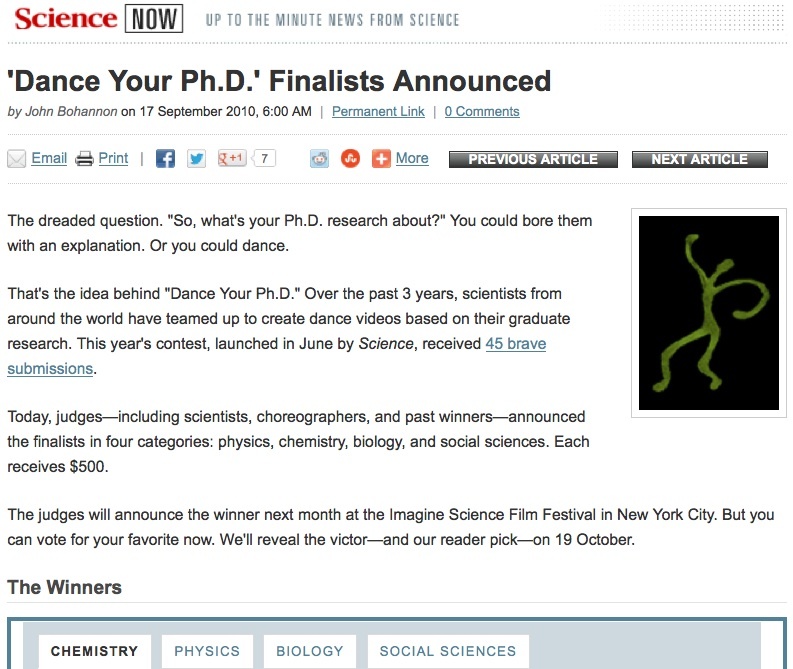 "Dance Your Ph.D.' Finalists Announced"
The dreaded question. "So, what's your Ph.D. research about?" You could bore them with an explanation. Or you could dance. That's the idea behind "Dance Your Ph.D." Over the past 3 years, scientists from around the world have teamed up to create dance videos based on their graduate research. This year's contest, launched in June by Science, received 45 brave submissions. Today, judges - including scientists, choreographers, and past winners - announced the finalists in four categories: physics, chemistry, biology, and social sciences. Each receives $500. The judges will announce the winner next month at the Imagine Science Film Festival in New York City. But you can vote for your favorite now. We'll reveal the victor - and our reader pick - on 19 October. The key to understanding de Jong's dance is the distracted guy on the couch. All of this is happening in his head: a video clip on a laptop, a signal going through his eyes, and ultimately information being processed in his brain. How all this adds up to visual awareness is the subject of her Ph.D. research at Utrecht University in the Netherlands.